The above are all Randomised Control Trials, analysed with references at authoritynutrition.com and a similar list is at dietdoctor.com showing a large majority of studies finding higher fat / weight loss in the low carbohydrate group of the trial to be better than in the low fat group. 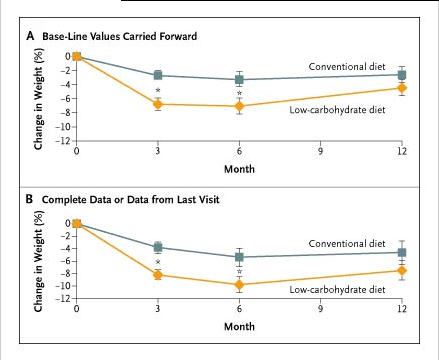 "A 2003 study found that a low-carb diet can produce quick results, but over the long term it does no better than a balanced diet featuring carbs." "Subjects on the low-carbohydrate diet lost significantly more weight than the subjects on the conventional diet at 3 months (P=0.002) and 6 months (P=0.03)"
"The percentage of subjects who had dropped out of the study at 3, 6, and 12 months was higher in the group following the conventional diet (30, 40, and 43 percent, respectively) than in the group following the low-carbohydrate diet (15, 27, and 39 percent, respectively)"
so it appeared that the low carbohydrate diet did at least work better for more of its participants in that they were more likely to stick with it. carrying forward baseline data means putting the weight of dropouts at their entry value, which makes both groups look worse than the reality of those who completed the programme. As we would expect there were improvements to blood lipid composition in the low carb diet of this study, but the NHS omit to mention this. Similar results appear across the studies linked to in the above reviews, and recent systematic reviews confirm the benefit of low carbohydrate eating in terms of reduced cardiovascular risk. So, a shameful piece of conventional wisdom and anti-low carb thinking is published in a context that requires balance, integrity and accuracy. Those of us hoping for a Damascene conversion on the way to Stockholm are disappointed, and the Swedish review that concluded "too much carbohydrate, not fat, leads to obesity" was clearly a better piece of work than asking "Dietitian Sian" for her opinion. 1. There are no essential carbohydrates that we have to eat in order to live. This is not the case for fats and proteins where we do need to take in some of each of them in food as our bodies can't make them. 2. There is no diagnosable disease of carbohydrate intake deficiency. Diabetes on the other hand is a difficulty in processing or controlling carbohydrates which leads to high blood sugar levels with clinical symptoms that can be serious. Excess carbs are stored as body fat once glycogen stores are full. 3. The human body at rest uses fats to provide about 2/3 of its energy requirements, with 1/3 from carbohydrates. At high / strenuous exercise rates the proportion of energy from carbs approaches 100%. Carbs for energy are taken from food and from glycogen reserves which are limited to a maximum of about 2000 calories (kcal). There is only 5 grams of glucose in your bloodstream (20 calories, about 15 minutes worth at rest). A lean athletic man of 75 kg / 165 lbs / 11 st 11 lbs with 12% body fat has about 70000 calories of fat reserves, ideal for endurance activity or periods of famine. In the absence of dietary carbohydrates the brain switches to ketones as a fuel and glucose is made by the liver - we are dual fuelled / hybrid powered beings where carbs provide short term power / acceleration and fats provide long term endurance and survival. The NHS articles assertion that we are 100% fuelled by glucose is incorrect. Carbohydrates are a low density fuel - would you rather haul fat at 9 calories per gram or carbs at 4 cal/g over the Antarctic ice sheet or up Everest ? Have a Happy Christmas !